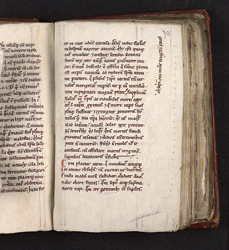 This volume is made up of three different manuscripts of differing dates, which were bound together by the 13th century. On a flyleaf at the front of the volume is a 14th or 15th-century press-mark 'lxiii al. Ca. ', which would be fairly meaningless by itself, but when compared with other manuscripts is recognisable as the typical press-mark of the Augustinian abbey of Holy Cross, Waltham. The 'al Ca.' part is an abbreviation of 'almario canonicorum', which means 'the bookcase of the Canons'. This diagram has the Earth in the centre (divided, as usual, into three continents), surrounded by eight concentric rings, the first marked 'luna', the Moon, the second marked 'sol', the Sun, followed by five planets, from Mercury to Saturn, and around the edge of the outer ring are the names of the zodiac constellations, with Aries and Pisces at the top.